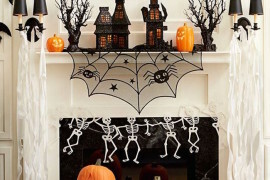 Halloween is the 31st of this month, and since we are in the middle of October you had better get started thinking about how you are going to scare the children (and maybe even the adults) when they come visiting in hopes of collecting their treats. 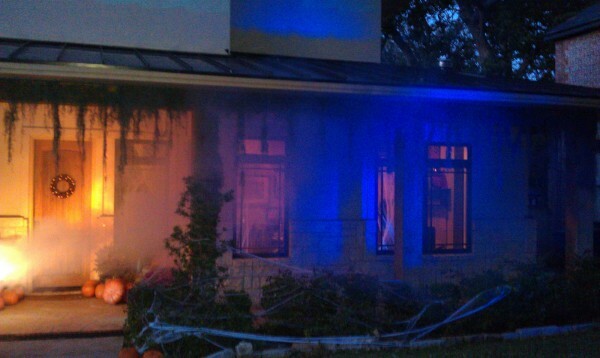 Since you probably have some party ideas and home decor selections, let’s look at lighting up the outside of your home. 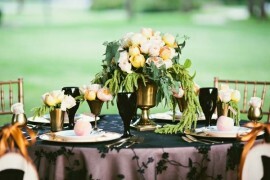 You need to create a certain ambiance to prepare your guests for what is in store for them. 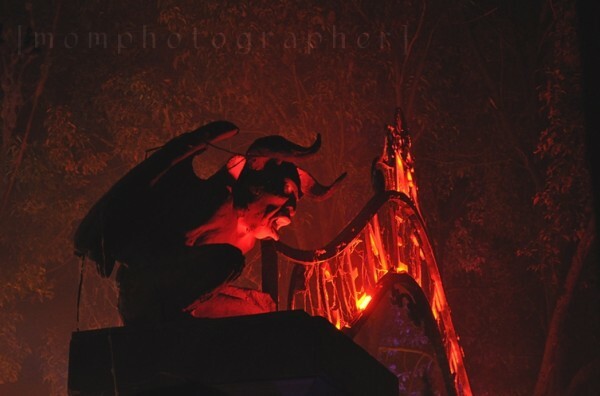 By using creative lighting and other effects, you can set the tone that will send chills up and down the spines of those who are brave enough to enter your lair! A dimly lit path leading to your door is a sure way to give someone the willies as they scurry to your bright doorway in hopes of safely retrieving some treats. Who knows what will jump out of the shadows? 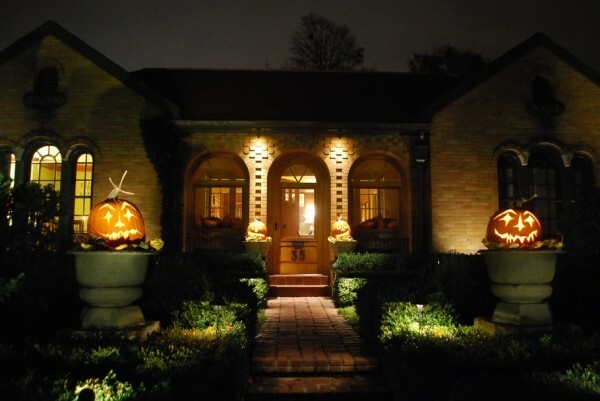 A few carved pumpkins staring at your arriving guests enhances the moment. A dark path through a graveyard adds to the excitement. 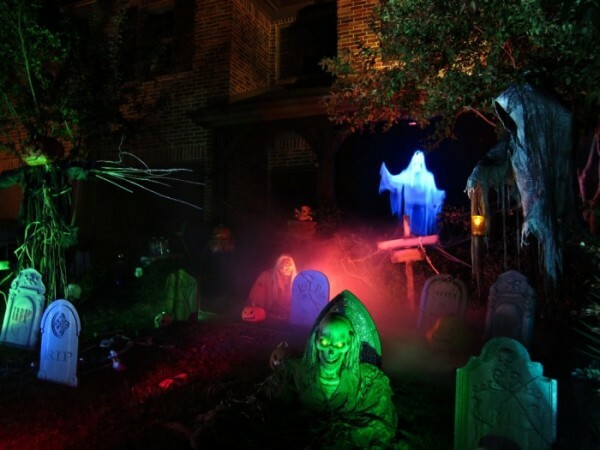 A colorful graveyard can attract a lot of ghouls, ghosts and other besties to approach your house on Halloween. 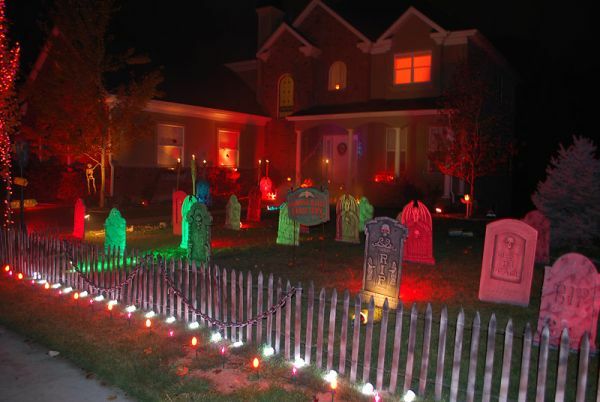 Red, blue, purple green and white lighting make for an attractive graveyard. Look at that waif! 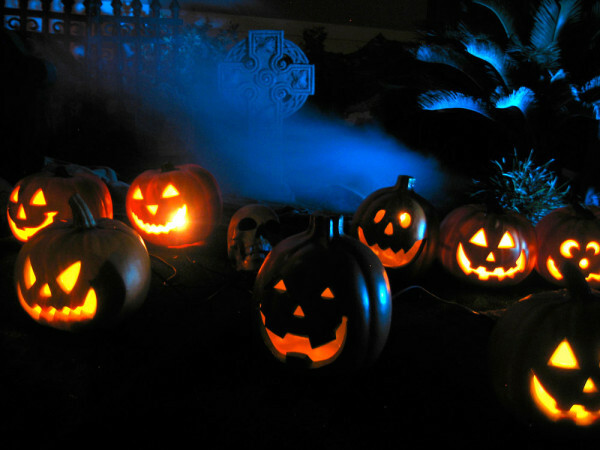 A good color contrast can add to the scariness with bright orange toothy pumpkins against a blue background accentuating the fern and cross grave marker. 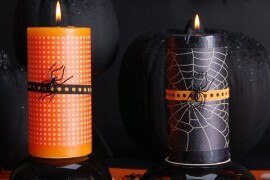 Add in a skull for an spooky embellishment. 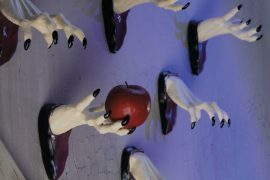 Dark blue light can add to the creep effect. 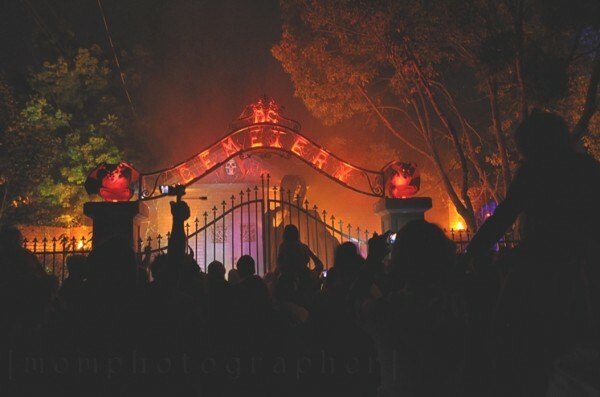 Combine that with a well-lit entrance and fog to send shivers down the spines of visitors. Reversing the light and dark areas can achieve the same scary effect. Look at the brightly lit castle below. 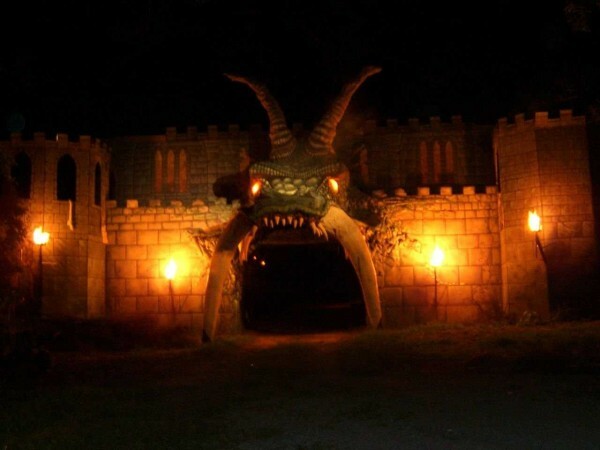 The building and entrance with the dragon mouth is well lighted, but the dark area beyond the threshold lets the imagination run wild with what lies beyond. Add some orange light, fog, cobwebs and some orange cones with police tape along a semi-dark pathway and you know this can intimidate even the bravest. Is that a mummy hanging from a noose? 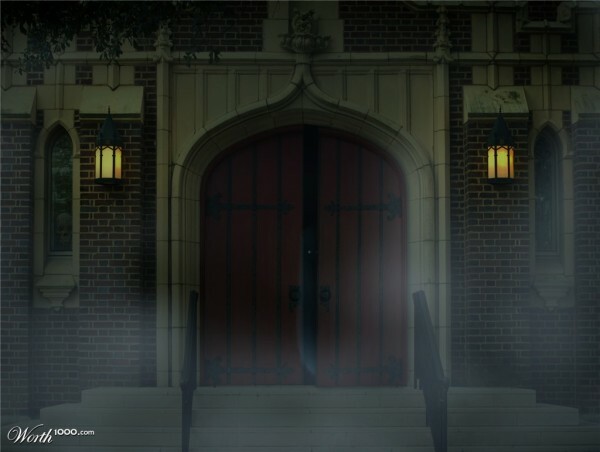 Renting or even buying a fog machine can be a great investment in adding the creepy feel to a building entrance. Even with minimal lighting, fog conjures up all sorts of terror. Partially open doors with a pitch-black interior draws the unsuspecting inward. If you need some ideas to really scare someone, just take some advice from those who scare people for a living. 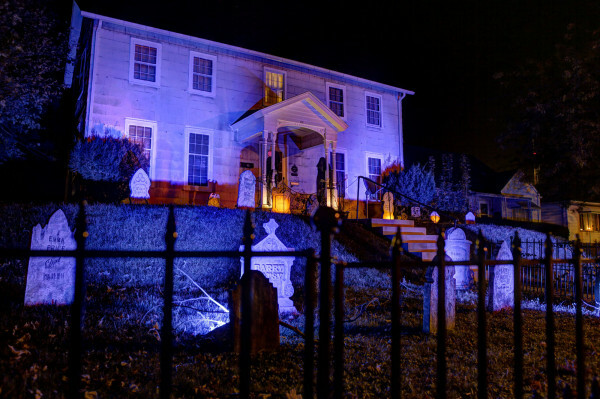 The Huffington Post has a nice write-up on Halloween haunted houses. You can find some inspiration from these. 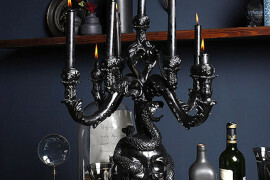 Check out this frightening dead thing lit from the bottom with darkness behind. A gargoyle benefits from lighting below which accentuates some features and obscures others. What’s tucked beneath his wings? 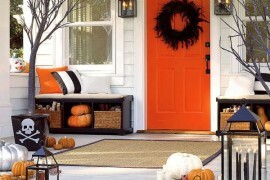 Take a dark front porch and add some dark orange lighting. 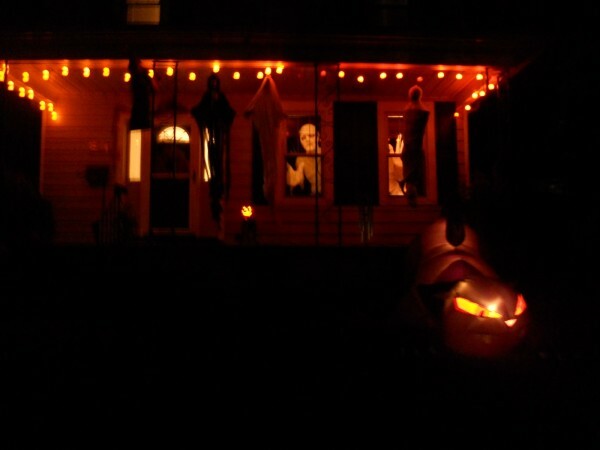 Then put some bright horror figures in the windows. This is a sure-fire method to scare some people. Zombies are all the rage, so why not light some up. 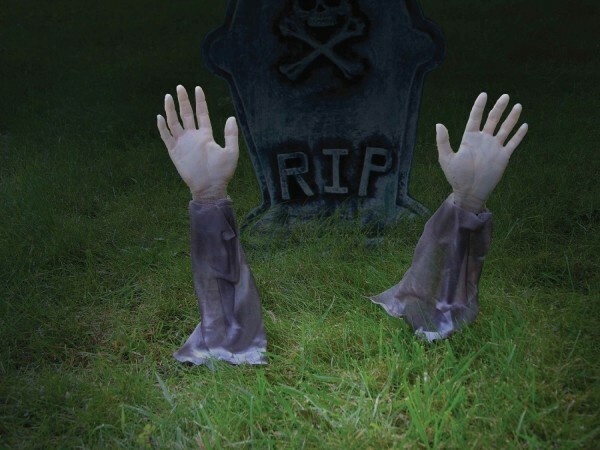 A pair of internally-lit Zombie arms reaching up from the graveyard is sure to send people running, especially if you use a proximity sensor to light them up when an unsuspecting victim gets close. 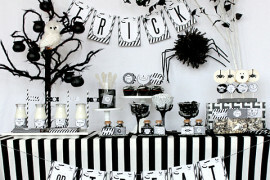 A bit of whimsy and happiness can attract the toddlers and provide them with a happy welcome. 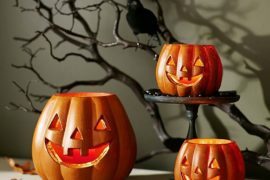 If you like seeing the little ones in their costumes, give them and their parents a wonderful experience. 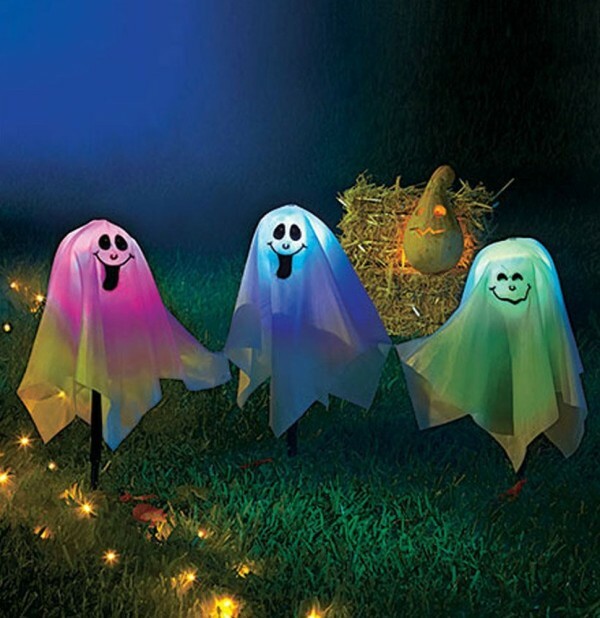 Colorful ghosts are so happy and child-like. 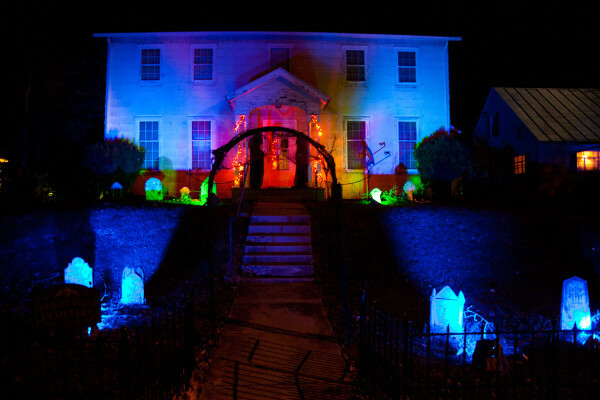 Powered by LEDs, these ghosts even change color! What kid (young or old) doesn’t recognize Mickey Mouse? Mickey has been delighting youngsters for nearly 85 years. 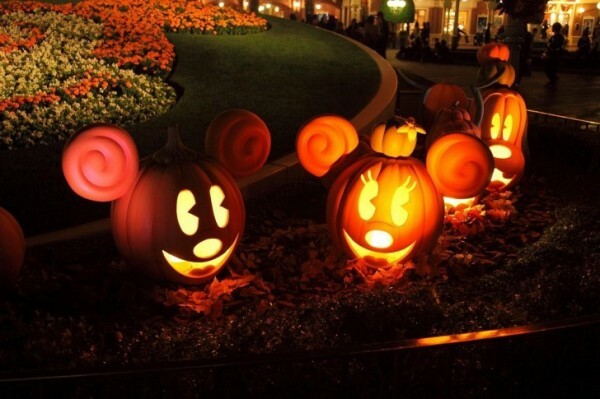 Continue the tradition with these Mickey Mouse pumpkin lights. 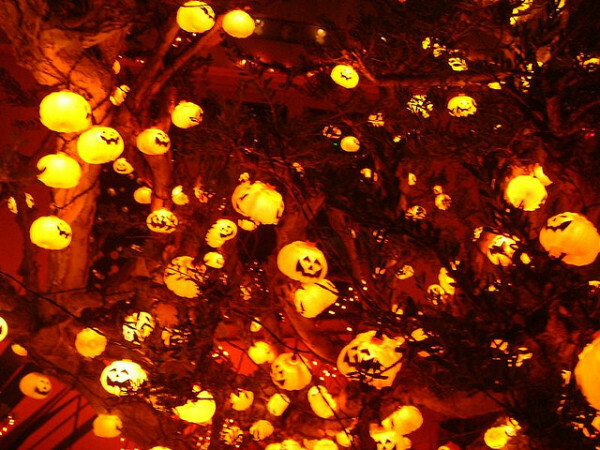 If you have the time, try covering your leafless trees with hundreds of lit pumpkins. 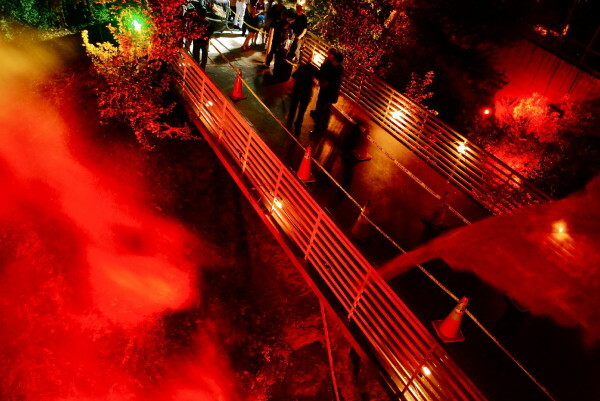 The area will be brightly lit so those who are scared of the dark will be comforted. 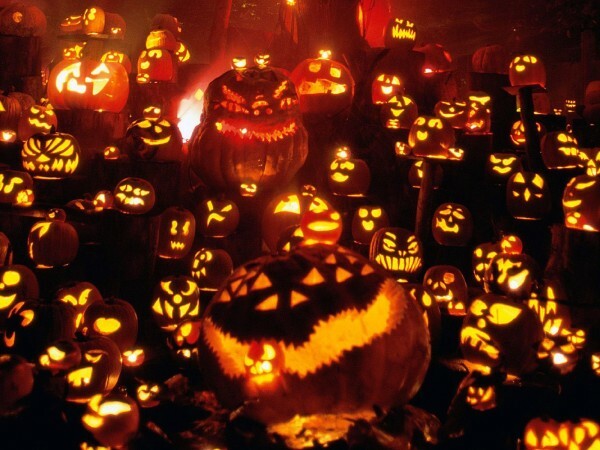 You might want to pick pumpkin lights that have friendly faces. 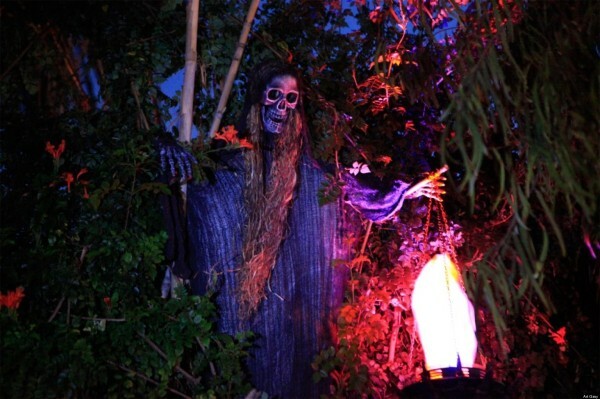 What lighting and effects are you going to use to provide a thrill ‘n chill to your Halloween guests?